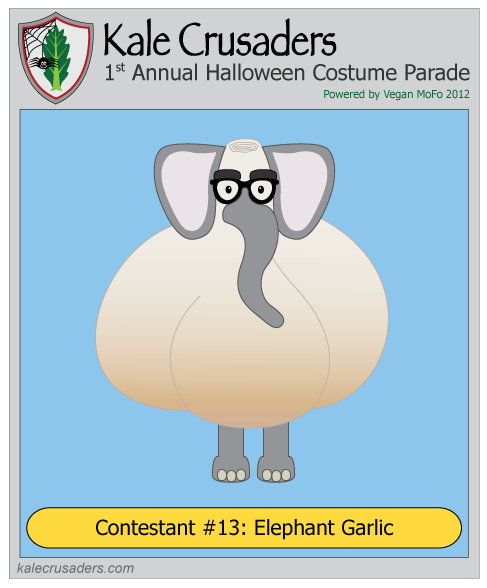 In October, we're posting one Costume Parade cartoon per weekday as part of Vegan MoFo. Want to go to the beginning of the Costume Parade? Start with some candy corn! Our next contestant is the Elephant Garlic in the room. Mr. Garlic is an enormous garlic bulb that opted for heft over strong taste (translation: elephant garlic tastes quite a bit milder than your standard garlic). Not typically one to take all the credit, you can find Elephant Garlic taking front stage elsewhere in elephant garlic cream and elephant garlic grilled vegetable skewers.